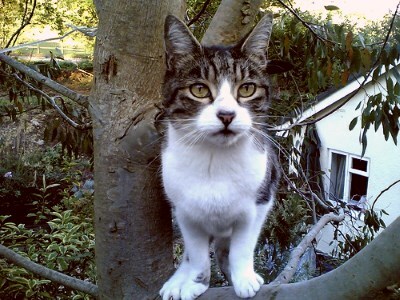 A Boulder woman was spotted climbing a ladder on Saturday to rescue her cat, Muffin, from a branch in an ash sapling. According to the woman, who declined to give her name, her cat does not always show good judgment. As we talked, Muffin wandered over to the neighbors’ fenced yard to taunt their dogs.